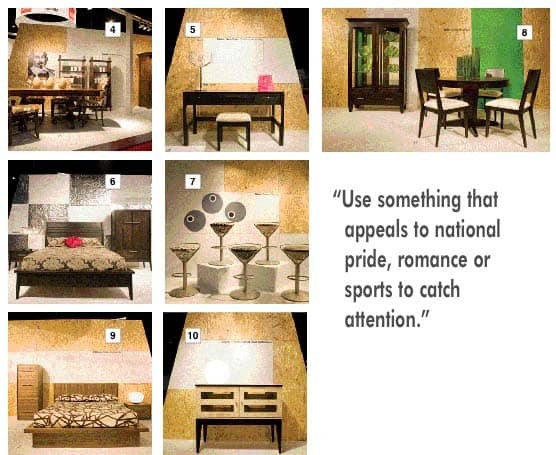 Trends Display highlights ways to make furniture stand out while on a budget. Key to increasing sales volume this season and (probably the next) is eradicating barriers between the consumer and the product. No more claustrophobic, tightly packed vignettes that limit both vision and imagination. Face it friends, it’s time to pull out all the stops! Pierre D’Anjou and Andre Caron, known internationally as presentation design experts, are past masters of unique staging. Every year, based on months of research traveling worldwide markets, they’ve invariably produced work replete with their own approaches to form and function, beauty and practicality. This year at The Canadian Home Furniture Market in Toronto they surpassed themselves. Said Pierre, “It is our ninth anniversary here, the tenth year of the Display, and I changed the concept. I wanted to make a BIG space like a big store within the confines of the display area at International Centre. To us, it had to be different, add something new to it, give it more impact to reach the visiting retailers. Then when they take their new ideas home to, in turn, reach their customers, get them motivated to buy. The visual impression was modernistic, architecturally stunning, perhaps even a touch intergalactic. The floating motorized “flying saucer” signage banner with its “Quality” message, topped a space defined by a small army of impressive trapezoid shapes composed of 3’ x 4’ panels fashioned from textured building material, and partially covered with reflective aluminum foil. The dramatic overhead aluminum beams carried fixed lighting, and “added structure to the design. We bought the lights for previous shows and found we could use them to good effect here again, both visually and economically. “We used white, natural wood tones and green throughout the Display, with fuchsia as the accent colour. 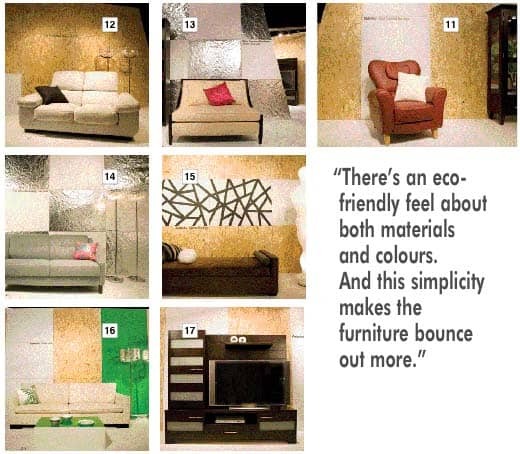 There’s an eco-friendly feel about both materials and colours. And this simplicity makes the furniture bounce out more. Always we offer top-of-the-mind basic concepts and practical applications that retailers can easily use themselves. Right next-door were two Dynasty  armless chairs, small but heavily cushioned in striking, black and white botanical print. They were placed against a broad panel in tropical seaweed green centred on one of the highly textured trapezoids. The accent table was also black and white and the perforated chrome shaded lamp picked up reflections from foil panels across the way. The width of one trapezoid was just enough to frame Valco’s contemporary vanity . Against the woodsy texture, the sophisticated finish and clean lines are starkly beautiful. Note the touch of fuchsia again, to maintain accent continuity. The crystal-look lamp both casts and reflects light and is another eye-catching device. A bedroom backed by angled white and aluminum rectangles has a distinct Scandinavian accent, in fact, the A.P. Industry collection is named “Copenhagen” . The look of northern minimalism is enhanced by the soft brown grained finish and horizontal hardware, and offset by the Maison du Beau velvet floral bed covering. The essence of spring again in a vertical panel behind MI-DI’s dining room , a sculptured round pedestal table with tapered-legged armoire and chairs. Decoration this time consists of vertical vases filled with “grasses cut flush at the top, and the glass plates in the armoire are printed with matching green graphics. There is more to this wide-armed white leather Via loveseat  than the picture reveals. The impressive back is movable; more than a recliner, it’s a real comfort zone! Its placement against the textured, natural-looking backdrop with its one white 3’ x 4’ panel, makes the product jump out, impossible to ignore. There’s always room for retro when it’s subtly delivered. KSL’s blue gray sofa  could flex from bedroom to library to a loft’s open spaces with aplomb. 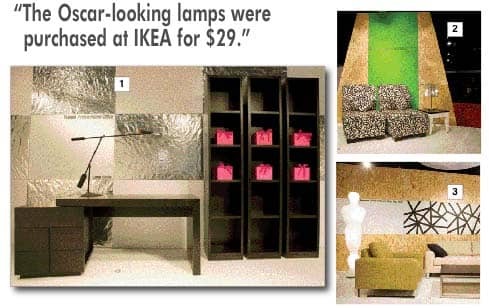 The foil panels reflect, as do the crystal look-alike lamps, a cool look heightened by the show’s signature fuchsia. Pierre’s abstract art again on white between natural panels draw the eye to a Lucy Au sofa , unexpectedly multi-use. A delicious deep chocolate brown, “Numa” is accented with blue, gray and the “Snowball” accent to balance the Oscar look-alike guardian! Throw off the cushions and turn it into a bed! The winter white world outside International Centre didn’t deter the nearly 10,000 visitors. It was noted that most retailers were owners and buyers this year, and sales were optimistic. Spring’s definitely not far behind. If your showroom space has a dark corner or two, strong green tones, a botanical flavour, mixed with light woods will automatically revive thoughts of April flowers! Gen-Lite’s crystal floor lamps cast a sunshine glow on Italdivani’s beige silk sofa , “Canape Sottile”, green and white accent pillow, and green vinyl covered plexiglass table, (a quick buy from Crate and Barrel!) backed by vertical green, white and natural panels. A big unit designed for big technology, a hit with masculine visitors, was a dark, solid wood entertainment centre sparked with horizontal silver-tone hardware, placed alone on a white floor and framed by vertical natural and white panels. Just what the consumer is looking for from Creations Vie Bois . There’s room for every bit of gadgetry invented by man from a spanking new plasma television to DVDs to extra bags of popcorn! The emphasis was certainly Canadian-made goods, but the European Community was present and accounted for. This year manufacturers switched their focus from product to the enhancement of customer quality of life, and stressed the importance of the female consumer, at last! Upholstery makers talked about texture, durability and green issues. Everyone placed emphasis on stunning slender silhouettes for smaller spaces. Plenty of reclaimed, recycled wood was in evidence and storage possibilities increase with every Market, together with double-duty pieces. And, wisely, customization was queen of the show. Said Pierre, “Yes, we have problems in the economy, but the good times are going to come back. Some companies are doing well right now with their new approaches to the customer, new ideas, new products. Manufacturers and retailers both are becoming more creative, listening to what the customer wants.